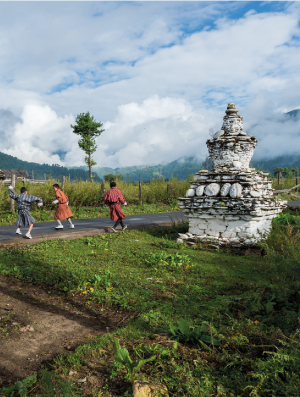 Bhutan’s rugged landscape is ideal for cycling enthusiasts. 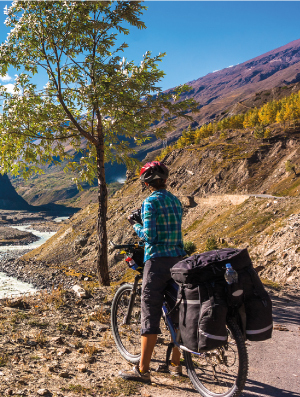 During this tour, you will pass by cascading waterfalls, sail through enchanting forests, pedal your way up challenging hills and soak in a plethora of exhilarating experiences. You will also ascend famous mountain passes such as Dochula, Pelela, Yotongla and Thrumshingla. The cool crisp mountain air will completely rejuvenate you and by the time the tour is over, you would have collected countless memories of the beauty of the Himalayas and will be convinced that Bhutan truly is a modern day ‘Shangri La’. 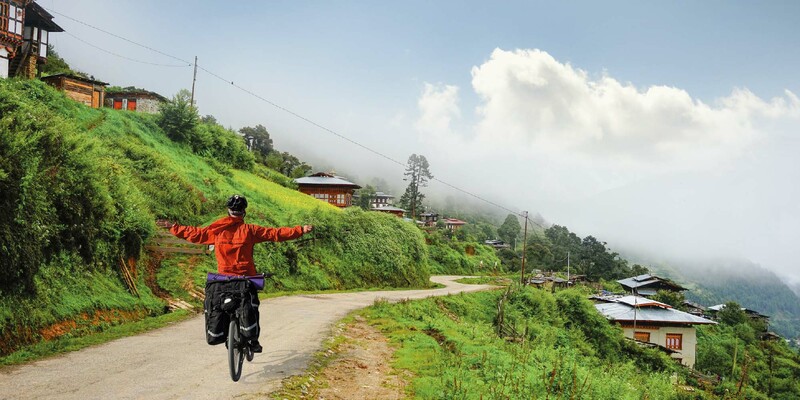 Experience the sheer bliss of exploring Bhutan on a bicycle. You will pedal through famous mountain passes, serene jungles, and also pass by some of the most spectacular architectural attractions. There is a lot more to look forward to. 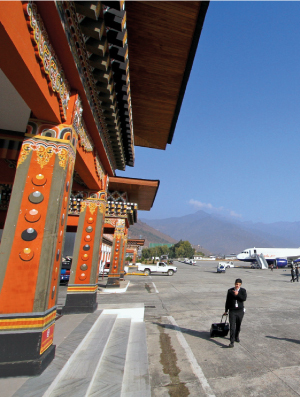 Fly into the beautiful town of Paro and take in the stunning scenery of the Paro Valley, the lofty mountains and lush forests. The town is also full of many sacred sites and historical buildings. Check into your luxury hotel, an elegant traditional Bhutanese building Overnight in Paro. The Paro Valley is enchanting. The pristine mountain streams, a single willow-lined road and mesmerizing rice paddies immediately cast a spell. 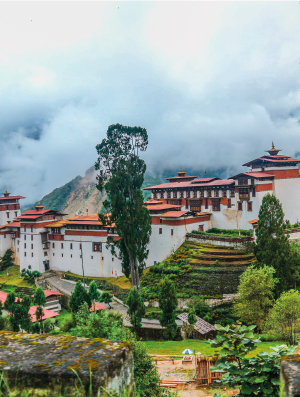 One of Bhutan’s most regal Dzongs (fortresses) is also located here. 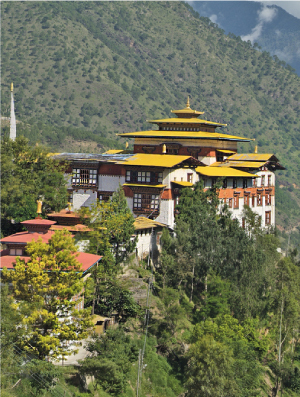 Today, you will visit the Taktsang Monastery, also known as the ‘Tiger’s Nest’. It is amongst the most venerated Buddhist pilgrim sites on the planet. Belief goes that Guru Rinpoche flew here on the back of a tiger and meditated for over three years in a cave. Many temples have been built on the precarious hill slopes here. To visit, you will need to walk for almost two hours up a steep footpath. Yes, the views are more than worth the effort. After spending some time at Tiger’s Nest, you will head back to your hotel. This evening, you will also need to set some time aside before and after dinner to prepare your bike for the next day’s journey. Overnight in Paro. 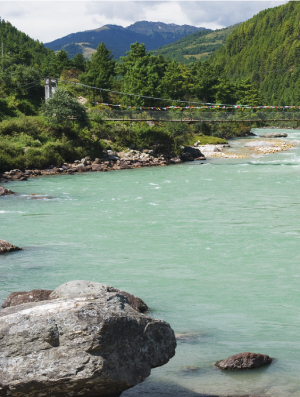 Today, you will go on a gradual ride along the River Paro Chhu (Paro River). 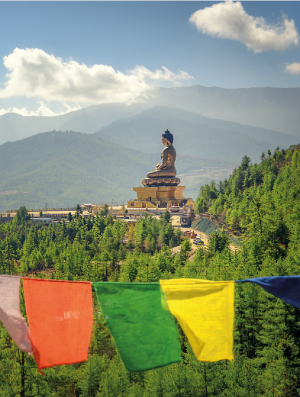 You will see some endearing works of Bhutanese architecture and prayer flags on the hill sides as you cycle your way to Thimphu. It’s about 25 km from Paro to the check point and from there another 31 km to Thimphu city. The check point is busy with traffic moving towards Southern Bhutan. The spot is appealingly marked with three stupas in Bhutanese, Nepalese and Tibetan styles. You will have to pedal your way up a gradient of around 5% along the River Thimphu. There is little traffic and it’s a quiet ride punctuated by a few stops for photography. Finally, you will enter Thimphu city through a huge gateway. Relax in the comfort of your hotel in the evening. Overnight in Thimphu. 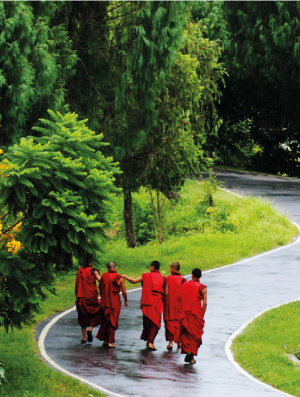 After an early breakfast, you will cycle through the busy Thimphu traffic for about 4 km until you reach Semtokha. From here, you will climb your way up for a distance of around 17 km to the Dochula Pass. During the climb, you will catch glimpses of the Semtokha fortress and also enjoy spectacular mountain views. The sight of hundreds of prayer flags fluttering in the breeze and as many as 108 stupas of Druk Wangyal Lhakhang Monastery will also do its bit to charm you. Finally, you will stop at Dochula Pass for lunch at an altitude of 3015 meters. 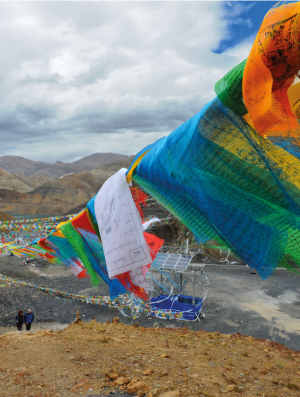 Luxe Special: take a moment and hoist your own personal prayer flag. Locals believe that prayer flags generate spiritual vibrations that are released when blown by the wind and the prayers are carried in the air. Any person and place touched by the wind will be happier and uplifted. Post lunch, you will resume your journey and enjoy an exhilarating descent of 36 km to Lobesa and on to Punakha, where you will spend the night at your hotel. Overnight in Punakha. Today is a challenging day for you as you will climb roughly 3300 meters to Pelela Pass. 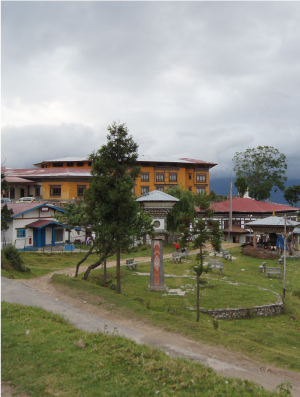 The first stage of your journey is 12km to Wangdue and then a further 10km to Chhu Zomsa. This is where the climb starts. As you exert yourself cycling uphill you will see the vegetation changing, from broad leafs to conifers and then to alpine shrubs. The temperature drops as you climb higher. Eventually you will reach the summit of the Pelela Pass and from there descend all the way to Chendupji. The temperature starts increasing and from the sparse shrubs at the top of the pass, you will again find yourself amongst thick lush vegetation interspersed with beautiful waterfalls. Continue cycling through Bjee Zam and onto Trongsa. Overnight in Trongsa. After yesterday’s epic ride over the Pelela Pass, today’s climb of 30 km to the Yotongla Pass will appear to be child’s play. The views get better as you ascend higher. Once you reach the summit of Yotongla, stop for a picnic lunch and then enjoy another superb descent of around 36km through blue pine forests and fields of wheat. Finally, you will reach Bumthang and spend the night in your hotel. Luxe Special: Enjoy a hot stone massage this evening to soothe those aching calves and muscles. Overnight in Bumthang. Situated at an altitude of about 2500 meters, Bumthang is much broader and flatter than any other valley in the country and is home to a number of dairy farms, wheat fields, and stretches of potato cultivation. You will spend the day exploring the Bumthang district and go on an excursion to the stunningly beautiful Tang Valley. This seldom visited valley boasts an amazing museum at Ugen Chhoeling Palace as well as offbeat lhakhangs and monasteries. A short hike takes you up to this palace, packed with cultural treasures. You will stop for a traditional picnic amidst breathtaking pristine surroundings. Spend the evening at leisure. Overnight in Bumthang. Today is another day that holds the promise of fantastic views of the Himalayas. As your accommodation is at the foot of the Thrumshingla Pass you will have to ride uphill for 30 km all the way to the summit. As you ascend, the air gets cooler and finally it’s a now familiar descent from the summit. This time, you will breeze downhill for 30 km to reach Mongar. Overnight in Mongar. You begin with a climb up to the summit of the Korila Pass and from there descend for 21 km into the heat of the Yadi Valley. From the village of Yadi, it’s a steady and undulating ride to Trashigang overlooking the River Drangme Chhu. Spend a leisurely evening at your hotel. Overnight in Trashigang. 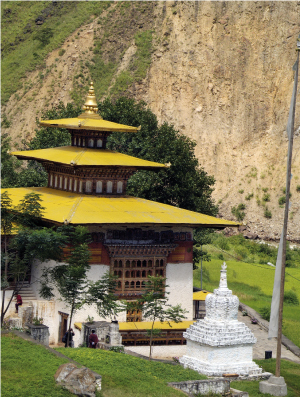 Depart from your hotel in Trashigang and pedal your way to Kanglung, from where you will ascend to the Yongphula Pass. 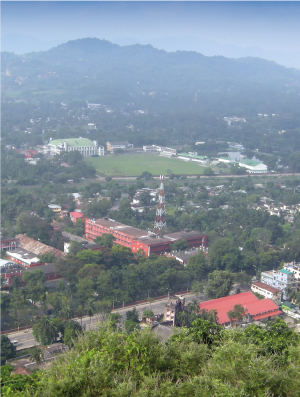 Enjoy a great descent from the summit and then some undulating terrain all the way to your hotel in Khaling. Overnight in Khaling. Today is your last day on your bikes on this cycling tour. 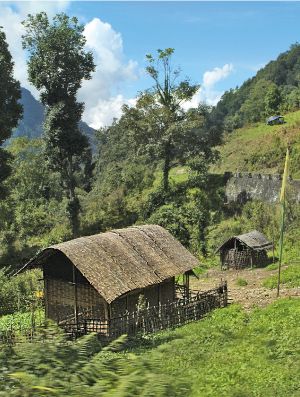 The terrain is almost flat as you make your way through the forests and valleys to your final destination at Samdrup Dzonkhar. Overnight in Samdrup Dzongkhar. This morning, you have a 3-hour drive to Guwahati, the capital of Assam, where you will complete the formalities for your flight to Delhi. 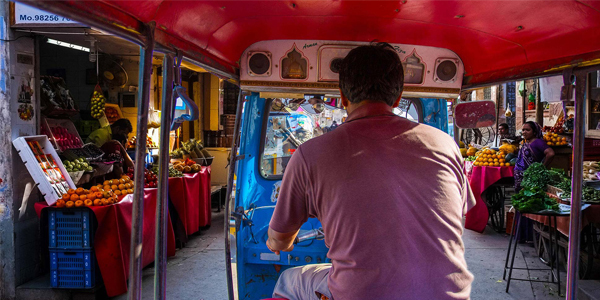 Upon arrival in Delhi you will be transferred to your hotel and spend the rest of the day at leisure. Overnight in Delhi. 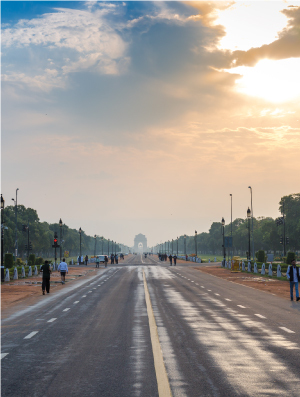 Early morning transfer from your hotel to Delhi Airport for your flight back home.